The luxury residences will enjoy 24-hour security with dedicated entry and access to residential elevators restricted to condominium residents and their guests. A private, secured garage with valet service; condominium residents have the option to self-park. Individual private storage areas will also be available. The entire 16th level will be dedicated to raising the bar for relaxation. All of the features and amenties will be only for residents and their guests. The amenities include: a high-tech fitness center, club room with a catering kitchen/bar along with a custom audio system, causal news room with a coffee and beverage station, outdoor entertainment areas with fire pits and outdoor cooking, and an elevated resort style pool with day cabanas. The residences range from 1,501 sq ft to 2,964 sq ft in size. There are 4 different floor plan options containing 2-3 bedrooms plus a den. The prices start in the mid $700,000’s. 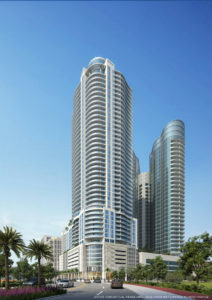 This is truly something to consider if you desire new luxury living on in downtown Fort Lauderdale. Please call 954-361-4558 or email info@csiderealty.com for more information or to schedule a private tour.